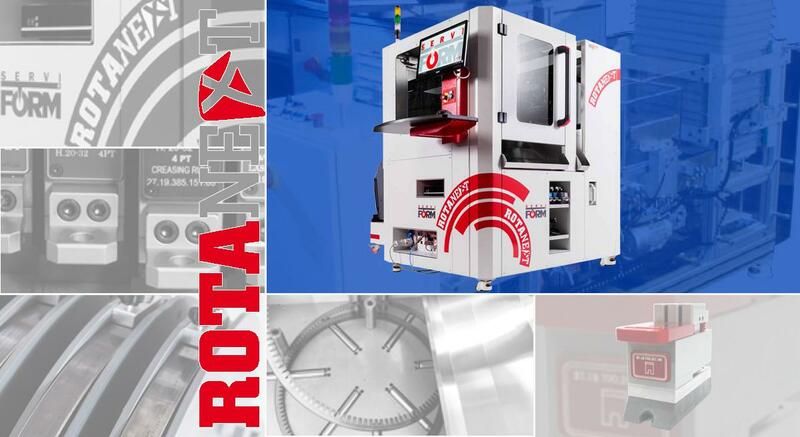 Rotax and Rotax lus have been the landmarks of rotary dieshop automation. Now with RotaNeXt we raised the bar, the future is here. Working head automatically adapts to diameters from 170 to 800 mm. Changing between a diameter to the next is a matter of seconds.All punching operations are performed by a new generation multi-tool cartridge. Electrically driven and powered by an electric press these cartridges are designed to perform multiple operations (e.g. cut, lip, bridging, bending marks, nicks, perforation and cut and crease). As standard all the machines of the SDDS (Serviform Digital Diemaking System) and also RotaNeXt are driven by a newly developed software based upon Windows. This software has been specially developed for the rotary diemaking industry. Main features of the software are: ease of use, perfect interfaceability with existing networks, extreme flexibility.With RotaneXt production of tailored perforation or cut/crease rule is extremely comfortable. Thanks to the highly developed graphic software the operator can produce special rule out of standard one in a few steps, costs related to special material stock are dramatically reduced.